Personal injury is one of the most competitive areas of law in the country. It may feel like it’s nearly impossible to get your website to show up on Google’s search results due to the volume of competing firms. Although challenging, it’s still possible to get your personal injury firm to show up online. Here are some tips to help your firm succeed in a saturated market by simply modifying the copy you use on your website. 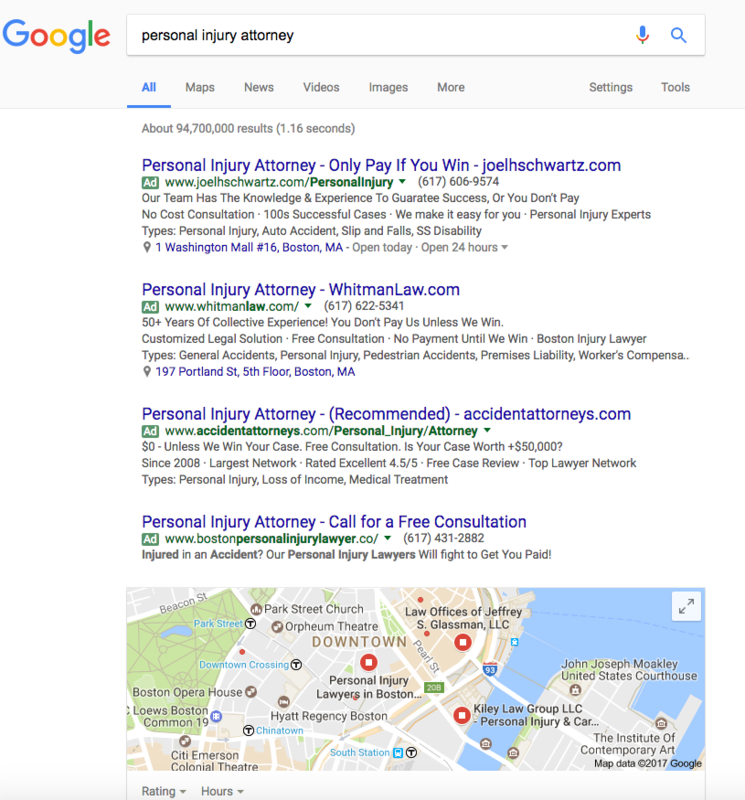 Our search example shows four ads (Google’s current maximum), plus Boston’s local results, as that’s where our office is located. If we were to scroll down, we’d see more results, but it would likely be impossible for your firm to rank on this page. While we still have two ads here, the page is much less jarring for potential claimants. This long-tail keyword gives results of real law firms, not just ads. 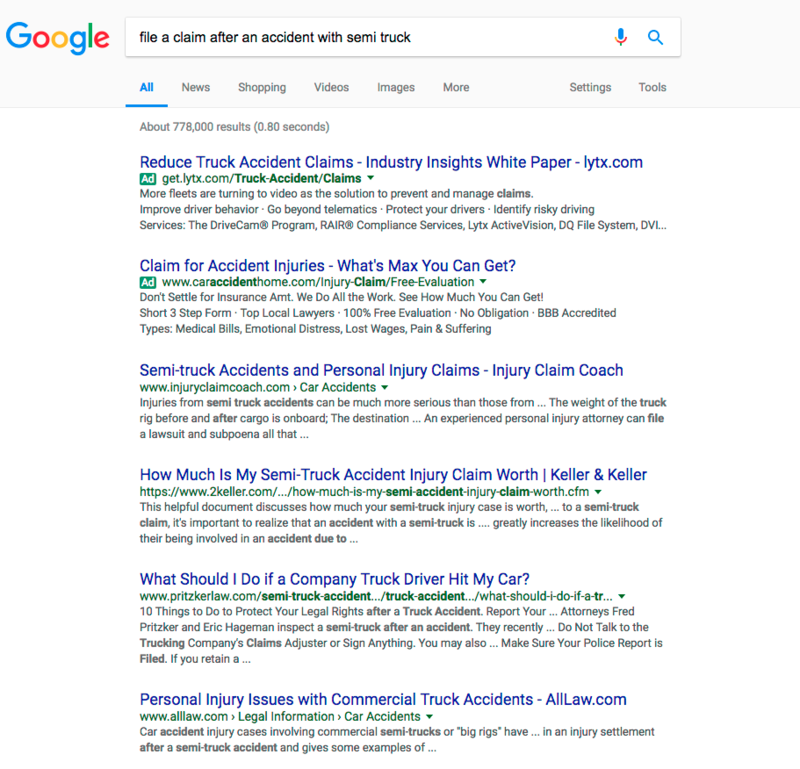 You can be as specific as possible when choosing your keywords: If you only want class action lawsuits involving defective drugs, write your website’s content accordingly. While there aren’t as many results as with shorter keywords, long-tail makes up 80% of Google’s search results. You’ll be missing out on 80% of potential claimants if you don’t focus on them! Google’s suggested search. Google will often suggest phrases as you begin to type a query into the search bar. Using these recommended options can help you identify what personal injury claimants often search for. Google Keyword Planner. This tool is free to use with any Google AdWords account. While the data is often just an estimate, it can give you some insight into what you might want to include in your content. Google Trends. This tool gives you no data on search volume, but it gives you a very accurate comparison between two different search terms over time. 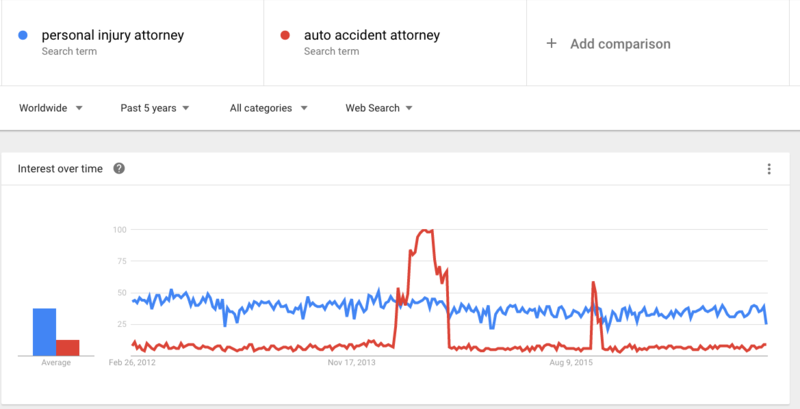 In this example, personal injury attorney overall gets more search volume, but “auto accident attorney” has peaked in the past. Keeping tabs on Google trends can help you focus on current topics to target the current audience. Unfortunately, even with perfect keyword selection, it can still be exceptionally challenging to get visitors to your site. To make sure you have a consistent flow of pending cases, you’ll need to diversify your marketing efforts. Purchasing personal injury leads can be a great way to increase your personal injury caseload at a low cost. If you’d like to discuss our personal injury lead availability, give us a call at 617.800.0089 today.